A postcard portrait of two Shilluk women (both with dotted forehead cicatrices) sitting either side of a basket, one wearing goatskin clothing, the other a textile. To one side a gourd vessel has been mended with stiches. Notes on postcard - "264 Copyright. G.N. Morhig, The English Pharmacy, Khartoum. 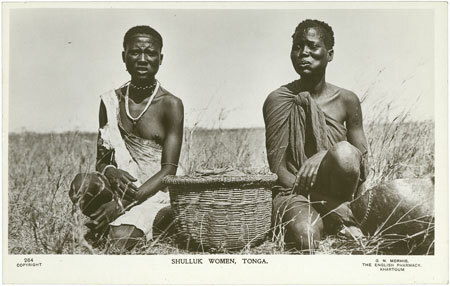 Shulluk Women, Tonga"
Morton, Chris. "Portrait of two Shilluk women" Southern Sudan Project (in development). 03 Jan. 2006. Pitt Rivers Museum. <http://southernsudan.prm.ox.ac.uk/details/1998.88.20/>.